WEC helped start Washington's first recycling program in 1972. 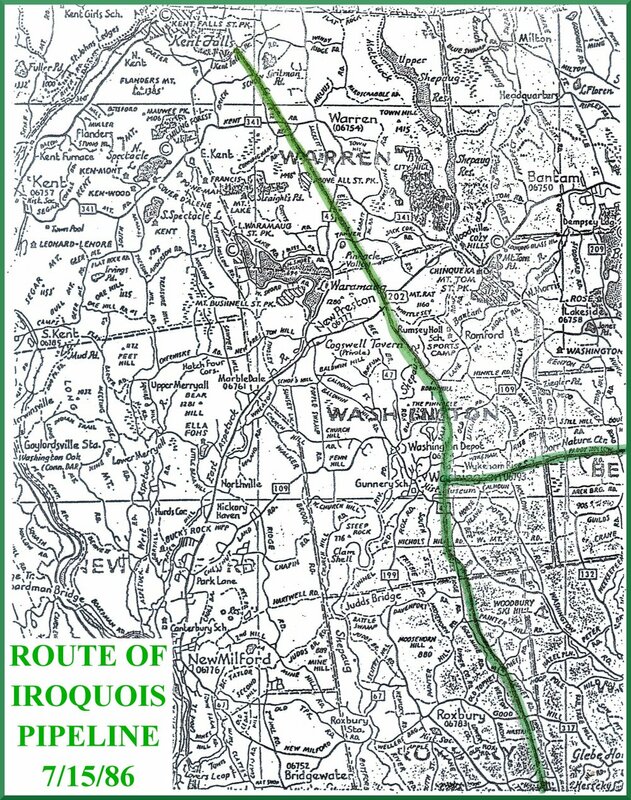 Proposed route of the Iroquois Pipeline. The pipeline would have run through the center of Washington. The Washington Environmental Council (WEC) was founded in 1971 when the environmental movement was just beginning in this country. The issues of the time determined where we focused our time, energy and resources. Over the years, we have enjoyed the leadership and support of many fine individuals and have formed an effective coalition with the various public and private groups in Washington and the surrounding region. In 1972 WEC advocated recycling and other sound ecological practices as part of everyday life in town. Through the following decades, we continued to broaden our environmental activities, while also successfully protecting Washington's environment by defeating, in cooperation with others, the Iroquois Pipeline that proposed running a natural gas pipeline through the heart of Washington and the Sempra Power Plant, that while based in New Milford, would have materially affected air quality in parts of our town and the Lake Waramaug region. WEC also supported the Shepaug River Association in its lengthy and successful effort to save the Shepaug River. Washington's beauty today is in part the result of environmental degredation that did not happen in the past due in good measure to timely actions taken by the Council. In the new century, the challenges have changed and so has WEC. Today, we are educating a new generation in important environmental issues through our expanding school programs, our environmental scholarships, our newsletters, our website and our lecture series. The challenges we face to carry out our mission have become more complicated and expensive. WEC's ongoing success will be based on our ability to identify new threats and opportunities and to effectively increase local understanding and support for us to deal effectively with them. WEC was an early proponent of Single Stream Recycling (SSR). After working closely with the Selectmen's Office for a number of years, WEC was extremely pleased when SSR was implemented town-wide in May of 2013. At the behest of WEC and with its strong support, a Town Ordinance was passed by a unanimous vote in March 2015 banning the storage, disposal or use of fracking waste or any derivative thereof in the Town of Washington. WEC's mission is clear, and together with our members, as good stewards of the environment, we will endeavor to keep Washington the unique and beautiful place that it is for the enjoyment of present and future generations.